The worlds of classical and electronic music are strange and uneasy bedfellows with a long history going back to the days of the first avant-garde tape experiments. Certainly both electronic composition and the classical and modern classical repertoires are considered “art” music and therefore have generally been enjoyed primarily by the intellectual elite. Many electronic composers have also written for orchestral instruments, and many modern composers, such as Glass, have been accepted as pillars of the classical community, with their works played in the great concert halls of the world. However, that success has usually been granted to composers who came from the rarified worlds of academia; as I noted in my article on Tod Dockstader, for an early electronic composer the lack of an academic association was often the death knell of an artistic career due to the lack of resources it created. Here we are in 2014, and the world is very different; millions of bedroom musicians release electronic recordings that are surprisingly good and artistically satisfying. No longer do you need special equipment or even have to record in a studio. There’s even a genre called “modern classical”, associated with ambient and “post-rock” music. You needn’t have attended Juilliard to release an album of “modern classical” piano music, for instance — you just do it, no matter what your “qualifications” are to be a pianist, and if it’s any good, that community welcomes you. The gates are open. Of course, the classical music establishment still exists, with universities and conservatories still churning out well-grounded musicians and composers who can play the bejeezus out of some Haydn, but the market for classical recordings is changing, mirroring developments in the pop world; if classical labels wish to appeal to the new listener who is used to hearing the freshest new sounds, including classical-inspired music, on Bandcamp or from a netlabel whenever he or she likes, they must innovate. This is where a composer like Max Richter comes in, with this release that bridges two worlds. He’s not actually the first musician with “ambient” associations to record for Deutsche Grammophon — in 1985 Vangelis released an album of modern compositions, Invisible Connections, on this very same label, and Mr. Richter can consider himself in good company in that regard. British composer Richter actually serves as an ideal bridge between the worlds of modern electronic and “modern classical” and the classical establishment; not only has he many successful film soundtracks under his belt, but he has released several albums on the hip Fat Cat label, the one that brought the world Sigur Rós’s Ágætis Byrjun, among other “post-rock” classics; he also has ties to the traditional world of classical in that he does possess academic training in composition from The Royal Academy of Music. 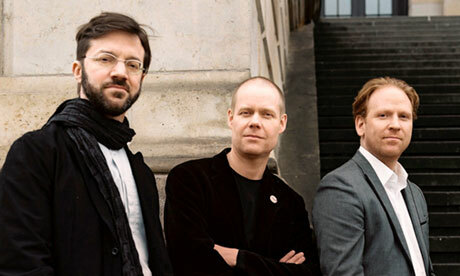 The future of art music very likely does lie in a meeting of the worlds of “post-rock” and traditional art music; it’s already happening with electronic music and should rightly happen with orchestral music as well as chamber music. The Kronos Quartet was definitely ahead of its time in the 1980s. And I’m sure the post-rock community’s worship of Arvo Pärt as a spiritual godfather has not gone unnoticed. Where once (well, some still do) classical music lovers frowned on rock as not being “serious” music (yes, I’ve had this said to me), now the worlds of pop, rock and electronica are as rich a vein of musical ideas for the modern composer as folk was for Vaughan Williams and Bartók. 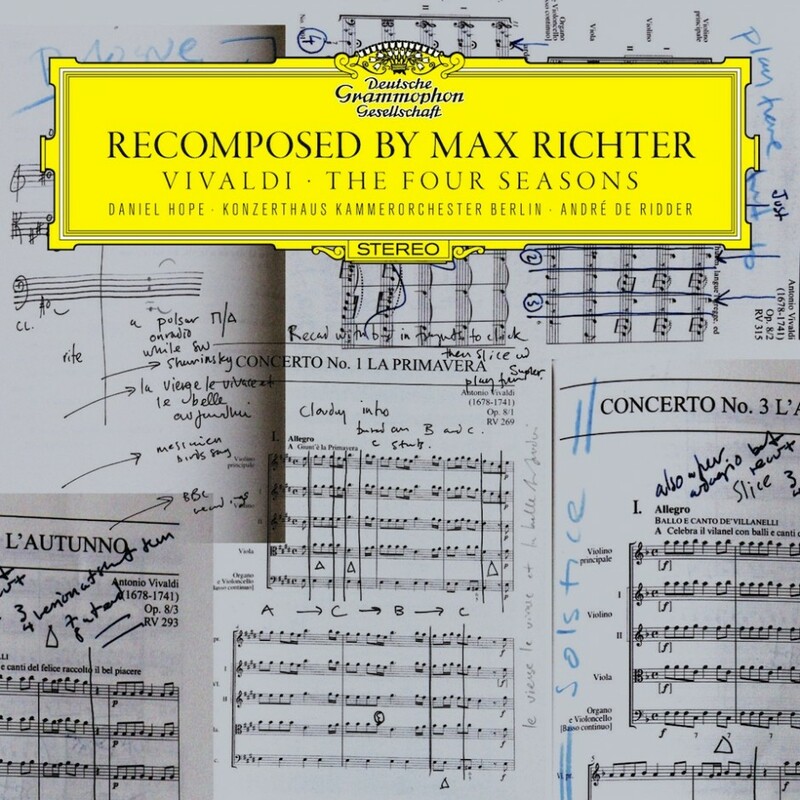 Anyway, all this brings us to the “Recomposed” series and this bold recording, both of which the label no doubt hopes will lure people like, say, me into an appreciation of hoary old classics like Vivaldi’s venerable Four Seasons. Well, not me, I suppose; I had a sister who studied flute performance so I know a lot about classical music and have a special affection for early music and mid-twentieth century avant-garde music. But you see what I mean; the intelligent music listener who has not attempted to dive into the pool of classical music. In “recomposing” Vivaldi’s eternally popular masterwork, Richter had the daunting task of re-imagining it while retaining enough of Vivaldi’s artistic soul and of the Baroque feel that its source is still recognizable. In this it’s different to Wendy Carlos’s Sonic Seasonings, which took Vivaldi as inspiration but went off in a radically different (but wonderful) direction. 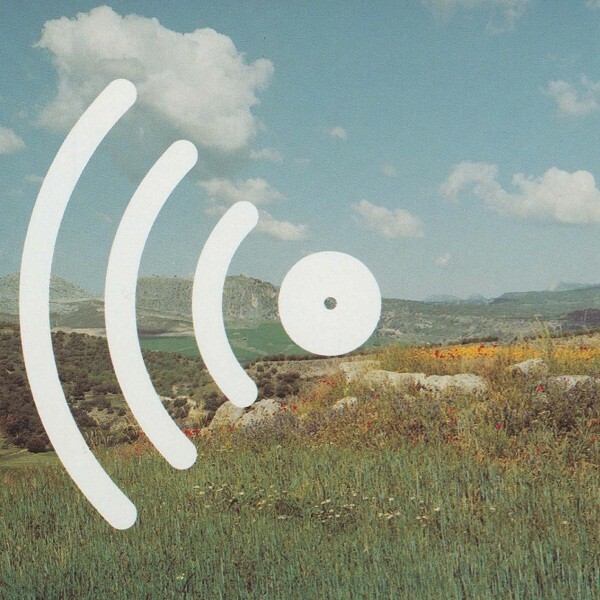 (Before I forget, there was also a rock interpretation of The Four Seasons, Ciclos by Spanish band Canarios, which is astonishingly good and actually complements this recording quite well). Part of the broader appeal of Vivaldi’s work with the general public, as opposed to merely classical aficionados, is that the titling (of the main sections, not the largo parts, etc.) provides actual, tangible imagery; that may sound simplistic perhaps, but let’s just say your grandma will likely enjoy the evocative images of “Spring” and “Summer” better than “Étude Op. 25, No. 7 in C-sharp minor”. It’s also conducive to the way that ambient and electronic instrumental music is imagined; much of ambient music is inspired by the natural world. It’s noted in the liner notes that Richter “discarded around three quarters of Vivaldi’s original” in his score for violin, Moog and the Konzerthaus Kammerorchester of Berlin. And you can certainly tell. Even so, this music was not what I expected when I first heard about the project; I had expected much more abstract deconstructions of the pieces, with less recognizable motifs and melodies and more electronics. And for the first two sections of “Spring”, that’s exactly what I seemed to be getting. “Spring 0” and “Spring 1″‘s sprightly, repetitive strings underscored by subtle bass notes definitely feel more Reich than Vivaldi and have a subtle pop-influenced building emotional tension that belongs more to the world of post-rock acts like A Winged Victory for the Sullen than to the Baroque. “Spring 2”, which has some lovely solo violin, does introduce a more typical Baroque feel definitely redolent of the first buds of early spring, while “Spring 4” introduces Vivaldi’s own joyful melodic theme; the feeling is more stripped down than “recomposed” here, a little less bombast and with a bit more playfulness. Similarly, the familiar theme from Vivaldi’s summer Allegro non molto begins that season, but a bold string part is interjected that adds a contemporary sense of drama; Richter states that he was inspired by the sounds of Bonham’s heavy kick drum; it’s interesting to note that the references made come from the world of rock, not classical. “Summer 2” again adds the tension of a repetitive part over a moving bassline, with Impressionistic strings in the background and solo violin; the effect is far closer to the dramatic end of progressive rock than to classical. Violinist Daniel Hope really tears into “Summer 3”, which interestingly stays fairly close on the whole to Vivaldi’s Presto, as does “Autumn 1” to Autumn’s Allegro. However, “Autumn 2″‘s dramatic harpsichord and gently shifting chords do bring a touch of an ambient music feel, almost like the sequencers on a Tangerine Dream album. “Winter 1” very again features dramatic violin solos but also some string textures that come close to pattern music. “Winter 2” is very Impressionistic in its arrangement, with almost a Scandinavian folk fiddle feel in Hope’s playing. And finally, Richter wisely ushers out the cycle in “Winter 3” with a piece of pattern-based modern classical underscored by the Moog. The CD also features five ambient deconstructions, accompanied by birdy field recordings, which I must admit are more to my usual taste. “Shadow 1” and “Shadow 4” cop Steve Reich’s act with their pulse. “Shadow 2” is a piece of abstract, ethereal looped ambient enhanced by reverb, and “Shadow 5” goes even further in a piece that features electronics redolent of a Steve Roach album. All in all, this album shows off the range of skills possessed by a very versatile and sensitive composer; while the last five electronic adaptations are more to my taste and frankly what I thought I’d be getting overall, the recomposed Four Seasons did grow on me. I’m not sure it’s “recomposed” as much as “rejigged” or “pruned back”, but of course those words don’t sound as good. I’ve not heard the other albums produced thus far in this series, but the important thing is this particular recording is not even close to a Switched-On Bach gimmick meant to attract modern hipsters — it’s a true update and enhancement of Vivaldi’s spirit for a more spartan, less florid age. Taken on those terms, it works admirably.